Jeff Robinson works out with his personal trainer Stephen Fusco. (CNN) -- Everybody says it: This year I'm going to get in shape. The mantra is repeated a few times, but then February and all the excuses come: I'm too busy; I have to work, pick up the kids, fix the doohickey in the kitchen, do anything besides get on that treadmill or face that trainer. Trainers say January is their biggest month, but their client roster diminishes by March. "You'd think right now that people wouldn't part with their hard-earned cash to hire a trainer and then not be serious about it, but it happens," said Drew Dinwiddie, a trainer who has a loyal following at a boutique but no-fuss gym in Atlanta, Georgia. "You get a pretty good idea quickly whether someone is going to be successful or they're not." 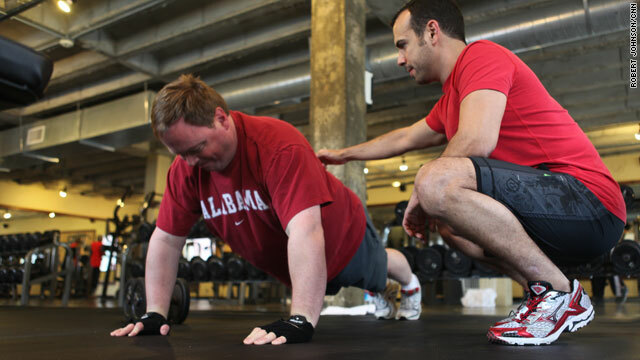 Trainers want potential clients to know that they aren't going to do the heavy lifting. They'll encourage and set parameters, teach proper form, give tough love when necessary and create a comfortable space free of judgment for their clients. But people who want to alter their bodies and improve their health must do more than sweat. Be truly willing to accept direction. I don't want to battle you. I'd hope someone thinks of it as a collaboration. "I've had people who are the top boss at their office come in and act like they are the top boss during a workout," Dinwiddie said. "I don't want to battle you. I'd hope someone thinks of it as a collaboration. You're doing what I tell you, but you're also telling me what works for you." If working out indoors seems like a drag, don't be afraid to pipe up and let your trainer know. Chances are they'll move your workout into the fresh air. Trainer Hyuk Chung, an Ironman triathlon competitor and longtime trainer, prefers to stay off machines and lift free weights and do resistance work using the client's body weight. "Machines can end up doing the work for you, and we don't want that," he said. "What matters is if you're pushing yourself so your heart rate is at its maximum. I can take you for a run outside, or we'll hit the stairs of a building." Don't say, "I want to lose weight." Instead try, "I will lose 15 pounds by February 15." Avoid thinking that you want to run a race someday. Sign up for a 5K during your first session. That's what Stephen Fusco did after he began training with Dinwiddie five years ago. Fusco was 50 pounds overweight after months of repeatedly being hospitalized to treat a rare degenerative tissue disorder. "I didn't think I could do it. Something just got into me, and I made it a routine. Eventually, your body begins to like it and need it. Fusco now trains at the same gym as Dinwiddie, is a certified yoga instructor, has run four marathons and is training for an Ironman. "There is no lasting fitness without the right nutrition," Fusco said. Fusco requires his clients to immediately began journaling what they eat. "If a client comes up with excuses about not doing that that -- 'Oh, I didn't have time' -- then it's probably a good indication they aren't serious." And the food log should include liquids, especially alcohol. If a client is a "three glasses of wine with dinner" type, he or she should cut that to three glasses a week, said Keely Towson, who has a master's degree in physical therapy and works with clients with diabetes and short-term injuries. Work out when the trainer's not around. She also gives her clients basic exercises -- walking slowly on a treadmill or lifting minimal weight -- that they can do in their home or at the gym when she's not there. There is no lasting fitness without the right nutrition. Fusco won't work with clients who won't exercise when he's not around. "I know from experience that one hour a week with me isn't going to cut it," he said. "When I see a client in the gym, I know they are into it and determined." If you're trying to get a tight rear end for a February wedding, you might actually do it. But odds are, you'll lose that tuned caboose by March. Don't work out because your spouse wants you to be thinner or because that slightly too-little black dress is mocking you. "That's not real motivation," Fusco said. "Really wanting to get healthy comes from a sincere need to take better care of yourself, not the person who's telling you to be a certain way." The next time you shop for groceries, look at what you're putting in your cart. Are there cartoons on the boxes? Not good. Some trainers recommend compiling recipes that are great-tasting without being calorie- or fat-laden. Bring the recipes in, and let them have a look. They have to eat healthily too and might be able to suggest a few tasty meals. Also, know what you like and eat what you like. If you don't like lima beans, don't include them in your overall meal change. If you like pizza, delete Domino's from your cell phone, and make homemade pizza with whole wheat or pita bread crust and healthy toppings, trainers say. Clean out your pantry and get rid of the junk. And, no, you can't keep the Oreos by saying you're going to have only a few a week. Recognize what is going to work against you, and separate yourself from those things, whether it's food or friends who might be naysayers to the new goal you've set. "Be proud of yourself for getting in the door. It's a good start," Fusco said. "How you finish is totally up to you."